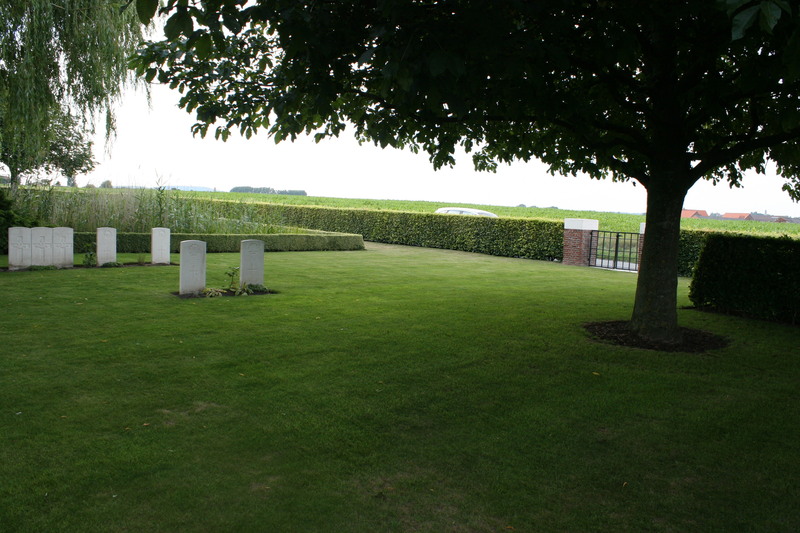 Looking north from the entrance to Prowse Point Military Cemetery towards Messines, or Mesen as it is now called (Messines Church is visible on the horizon towards the left of the photograph). Just to get your bearings, particularly if you haven’t arrived here via the link from ‘A Tour of Ploegsteert Wood – Part One’, for much of the War the front lines ran from left to right through the field directly in front of us; Messines itself was in German hands until June 1917 and was of course lost again during the German advance in 1918. View from inside the entrance to Prowse Point, with the headstones of Plot II, which include some of the earliest burials in the cemetery, nearest the camera. 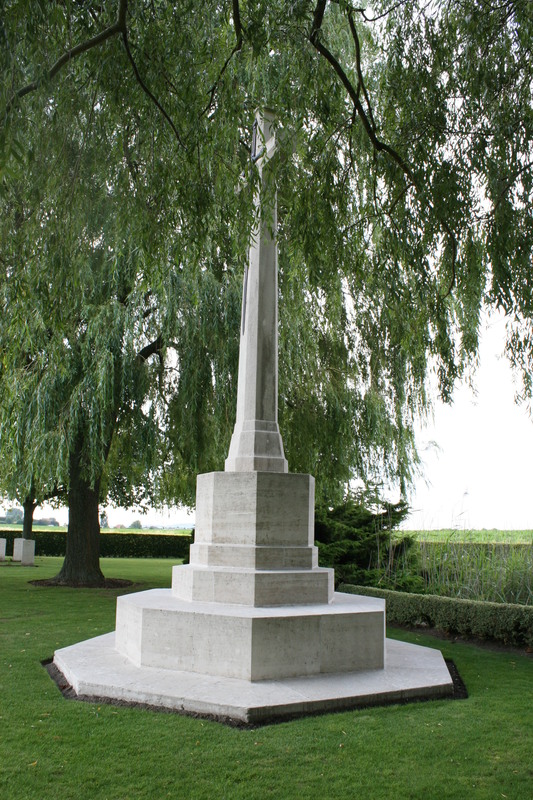 A few hundred yards south of Prowse Point lies Mud Corner Cemetery, last stop for those entering Ploegsteert Wood from the north. 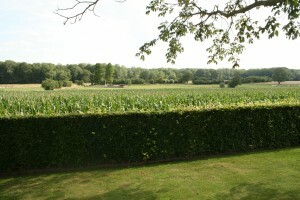 Looking due west towards the headstones of Plot IV. 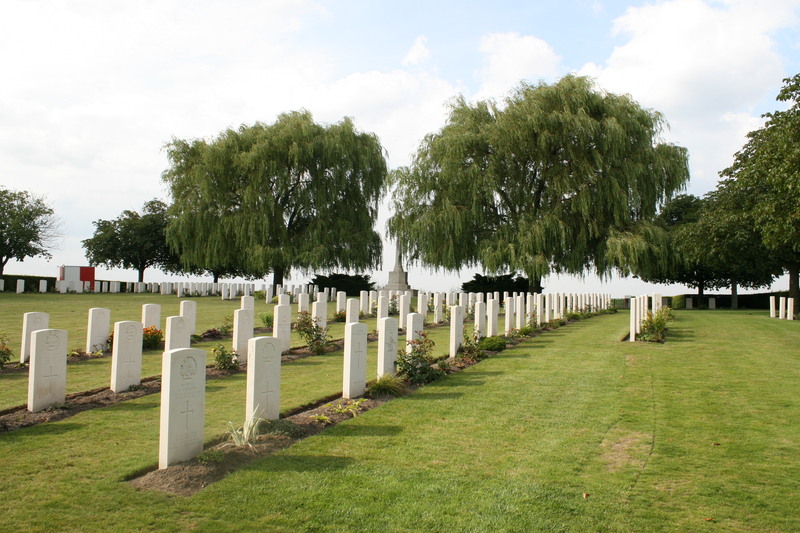 In August 2008, British archaeologists working on the Ploegsteert Project discovered the body of an Australian soldier, one of more than 6000 Australians missing in the Ypres salient whose names are inscribed on the Menin Gate in Ypres. The soldier’s rifle, haversack (containing a trophy; a German pickelhaube helmet), badges, a corroded identification disc and other items were recovered with the body, extensive detective work over the next year and a half culminating in a successful DNA match which finally proved his identity. 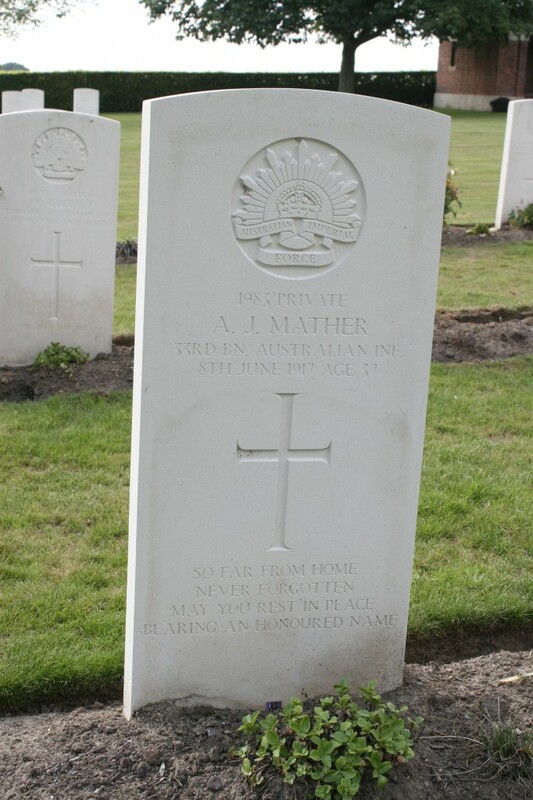 On July 22nd 2010, 93 years on, Private Alan James Mather of the 33rd Battalion, Australian Infantry, killed on June 8th 1917 during the Battle of Messines, was re-interred at Prowse Point by members of the Australian Army with full military honours (his headstone is nearest the camera in the photo above). Attendees at the ceremony included Lieutenant-General Ken Gillespie, Chief of the Australian Army, the Australian Minister for Veterans Affairs, the Australian Ambassador, and members of Private Mather’s family. 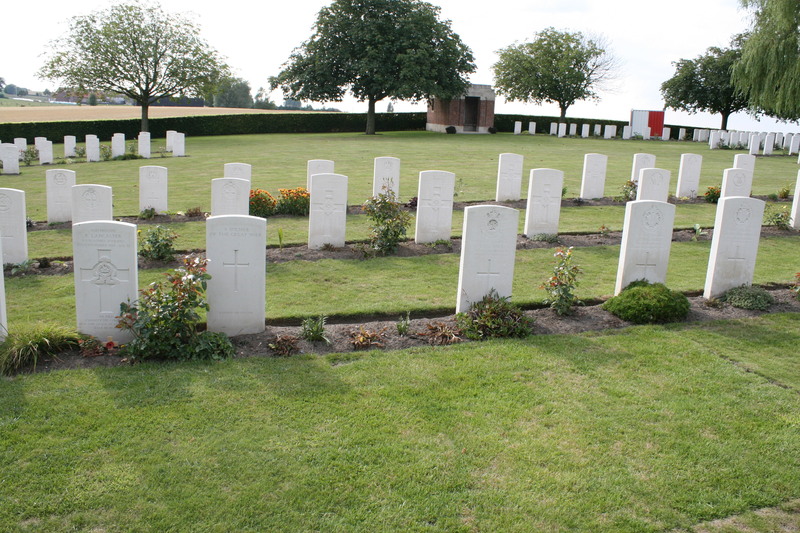 Private Mather (front row, far left) is not the only recent burial at Prowse Point. 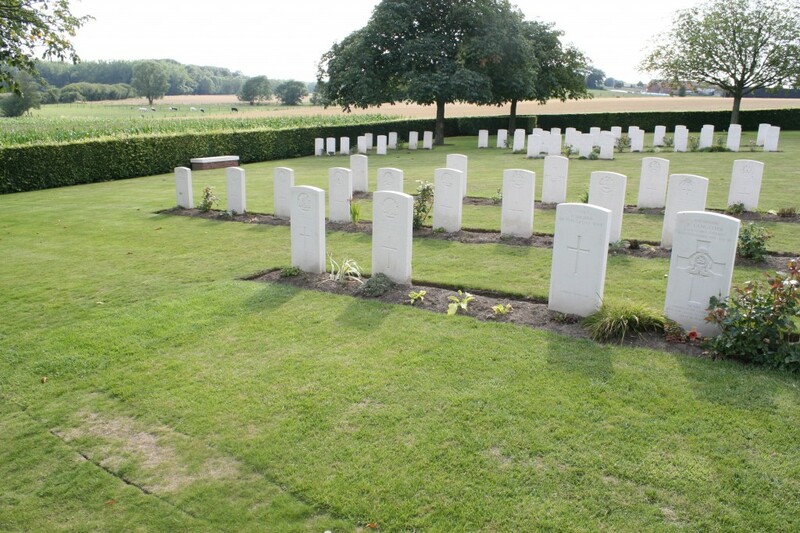 In July 2007 Private Richard Lancaster of the Lancashire Fusiliers (front row far right) and two other, sadly unidentified, soldiers were buried here, and in October 2001 another Lancashire Fusilier, Private Harry Wilkinson, had been buried in Plot I, both men (and probably all four) having been killed on the same day, November 10th 1914, during the First Battle of Ypres. Private Lancaster’s grave (front row, far left) is flanked by the headstones of the two unknown soldiers whose bodies were found alongside him (see also previous photo). Headstones of Plot III, with Plot I in the left background. 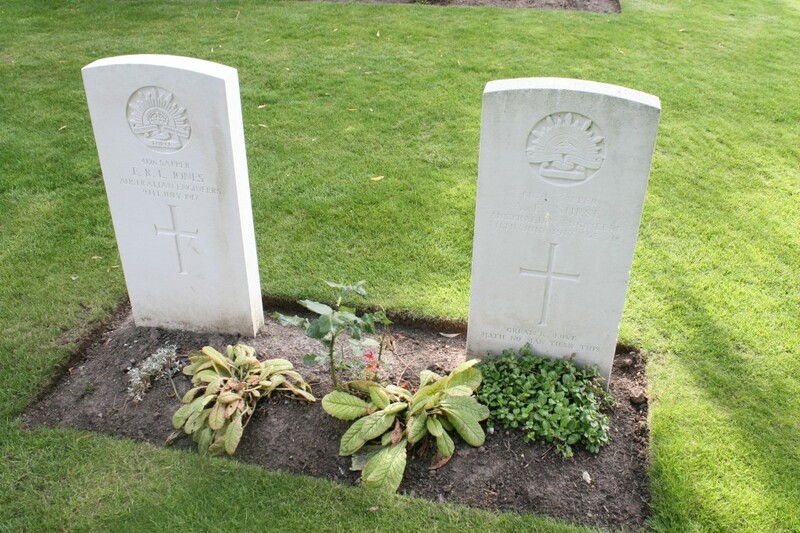 You will have noticed already that areas of the grass have yet to fully recover from the burial of Private Mather a year previously. 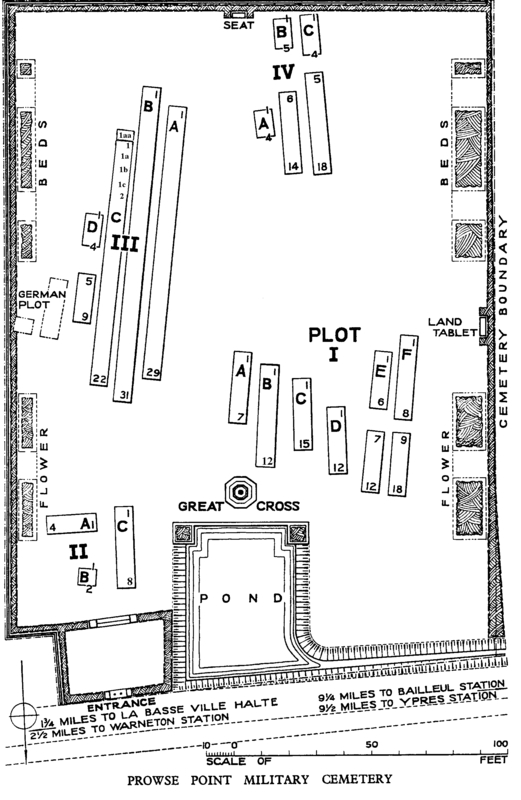 Back where we started; Plot II and the cemetery entrance. Final, classic view of Prowse Point. 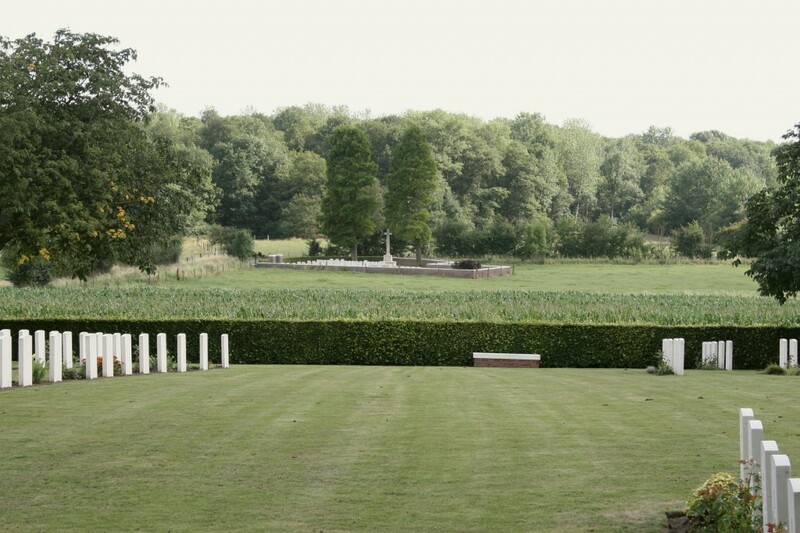 You will find many more photos and much more information on the cemetery if you check out A Tour of Ploegsteert Wood – Part One . Assuming, of course, you haven’t done so already. Pourquoi avez-vous abattu les marronniers du cimetière? Avez-vous pensé aux abeilles ? Triste ! ! ! ! Why did you cut down the chestnut trees of the cemetery? Have you thought about the bees? Sad ! ! ! ! I’m with you, Balders. Man the barricades! Thank you so much for this tour of the Cemetery. 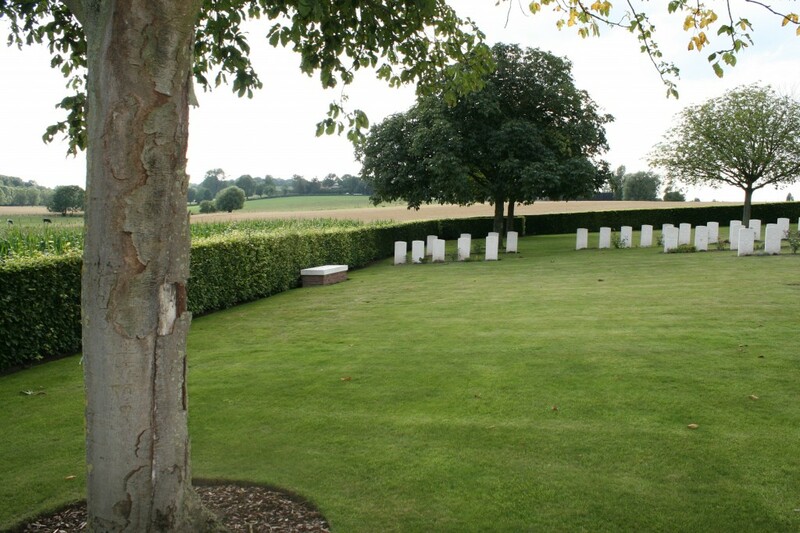 My Grandfather, Arthur Frederick Chalk is buried in Plot 111.2.C. 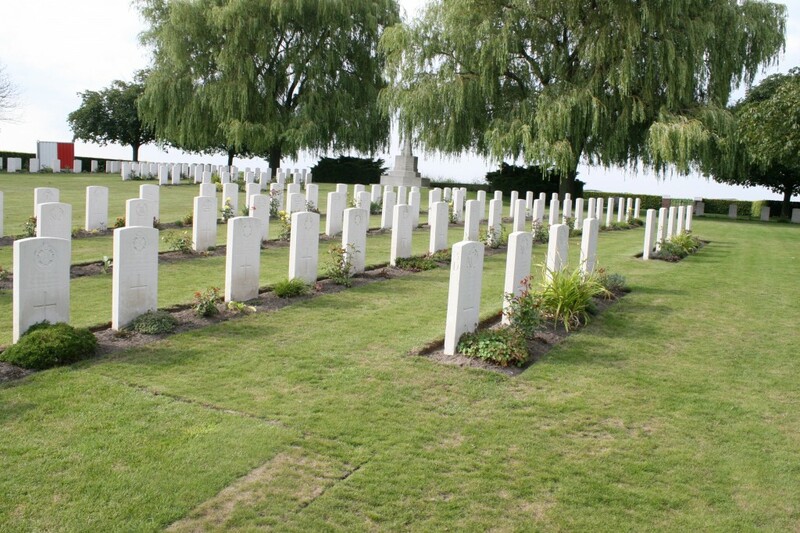 and it was very interesting to be taken on a tour of the Prowse Point Cemetery. I live in Australia and am hoping to vist Grandfather’s memorial headstone on the 100 year anniversary of his death. Hello Irene. Thanks for your kind comments; you are most welcome. I hope you do manage to get to visit Prowse Point in 2017. Btw, there are two Prowse Point posts on this site, so in case you haven’t seen the other post, just use the search box near the top right of the page and you’ll find it soon enough. 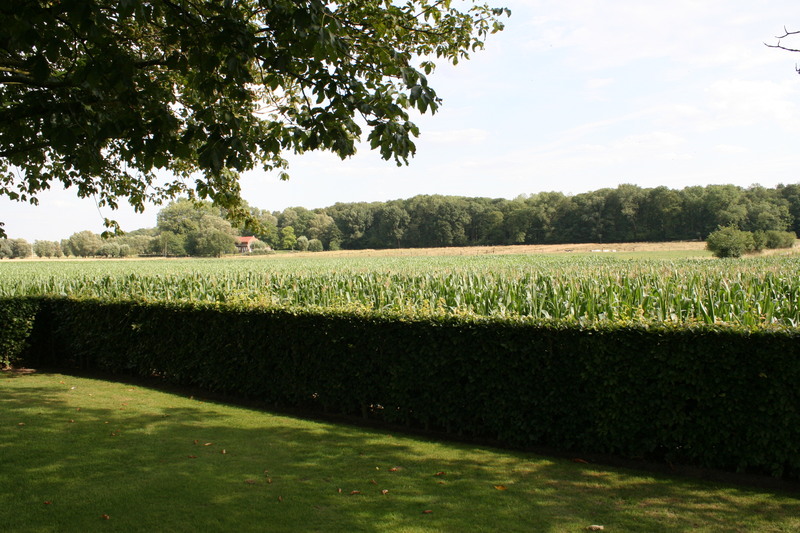 If you then follow the whole ‘Tour of Ploegsteert Wood’ (if you have the time and inclination) you will see much of the area where your Grandfather fought. 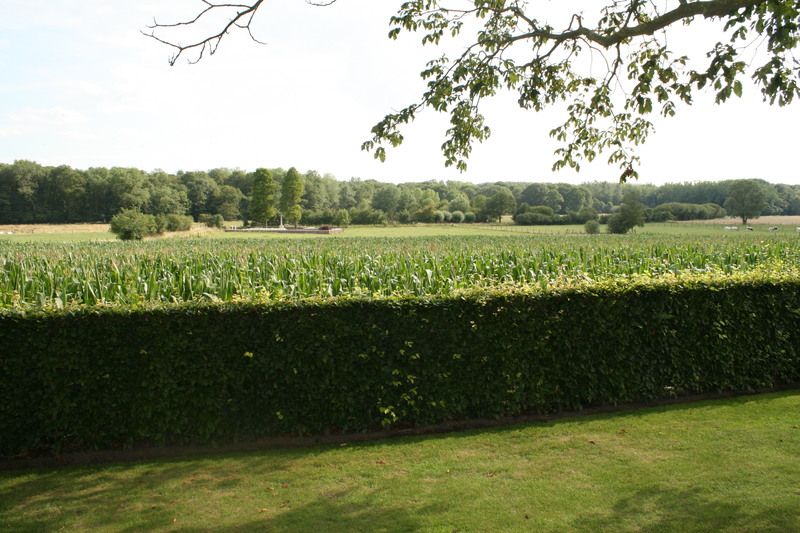 Hi Irene – I was one of a group of 180 who went to Belgium this Christmas to commemorate the Christmas Truce of 1914. On Christmas Eve we went on a torchlight procession to Prowse Point where we sung carols in English and German to remember all those men. 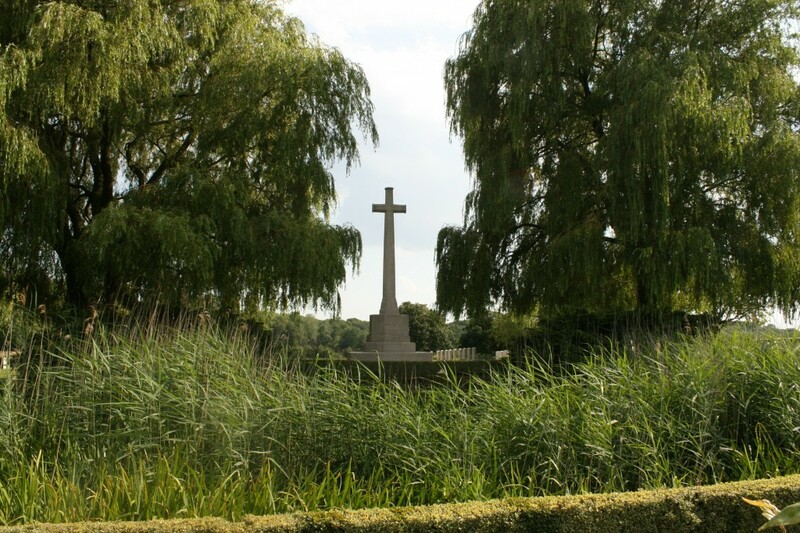 We were each given a poppy to place on a grave and after I placed mine, I shone my torch to read the details – Sapper A F Chalk of the Royal Engineers who died 27 September 1917. It was the most moving experience. I thought when I returned home I would try to find out a bit more about him and came across your post. I hope you read this and I hope you get the chance to visit.